I know I said I probably wouldn't post much since I was going to be extra busy this week. I have been. I will share with you in a later post what I have been so busy with, but for now, I thought I would share a few things I did get done to take to our booth. Hand painted vintage inspired wooden signs. The spoon rack is made from silver plated vintage spoons bent into the shape of a hook. I made one of these for the booth before Christmas...it never made it to the booth! SHHH! I kept if for myself and I am glad I did. We use it ALL THE TIME! It's never empty and has been one of the best things we added to our entry way. I made 2 for Christmas gifts and they were a huge hit with my sister-in-law and step mother. I have made a couple of other with smaller spoon hooks for the booth, but hadn't made a large one like the one I kept. I finally had enough serving spoons to make another one to sell. Here is how ours usually looks! Mr. T has a small hobby himself. Collecting sports memorabilia. Mostly for Minnesota sports and a few Kansas City things (that's for me). He has lots of ideas, but has run out of room for any new projects for his 11 x 14 room. So he has moved to framing photos for a small space at our booth. Here is one of the newest additions. A little something for you guys out there! I was hoping to get this posted before we left town last Thursday, but it just didn't happen. We had too much to get ready. Leaving town with a 2 year old is a lot of work. None-the-less, we went to Wisconsin Dells for 4 days for a family reunion with my husbands family. We were meeting up with his cousins and uncle from Minnesota. All in all, there were 21 of us! Have you ever tried to get 21 people to agree to the same thing? Well we did it successfully! It was a wonderful time, and great to get to see everyone. Looking forward to the next adventure! Before we left town, I scurried around to get a few things done to add to the booth. We had sold the beautiful blue/gray desk (aka "the outlet beast"), which left quite a hole that needed to be filled. 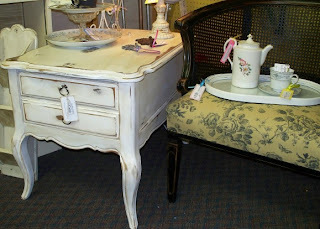 So I managed to get a French Styled end table (click the link to see the before) painted. The pics are not the best as I did not have time for staging and they were taken at the booth! 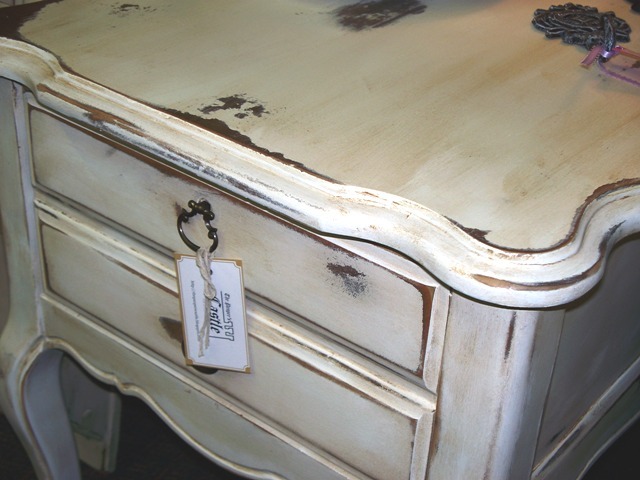 I painted this one basic white, distressed it heavily, and then antiqued and sealed it with Minwax Special Dark. It's not exactly what I had envisioned for this table, but it was primed and ready to go. Although, it wasn't my vision, I still like the way it turned out. 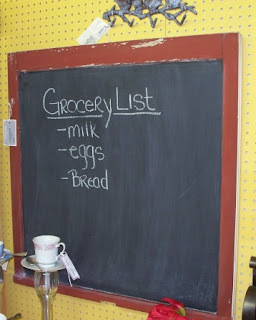 Another quick project I was able to get done....Chalkboard Windows. My neighbor now has a house full of new windows (jealous) and I asked if I could have their old ones. I am sure the window people thought I was nuts! But I ended up with about 30 sashes (tops and bottoms) of their old wood windows. 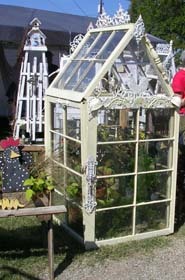 They are not "antique" windows but they are solid wood and about 20 years old. Good news is....that is what makes them perfect for a chalkboard and perfectly safe for kids. 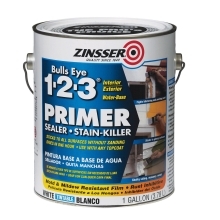 The paint is guaranteed not to be lead base since our homes were built after 1980, but old enough they are starting to show weather and the paint is chippy and pealing! Not so good for our homes, but perfect for this project. Thank you neighbors for your trash! You are the best! This is a quick and easy project. 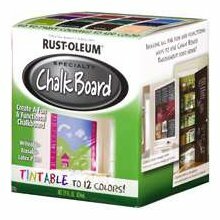 Simply tape the wood off, prime your glass and then paint with 5 coats of chalkboard paint. 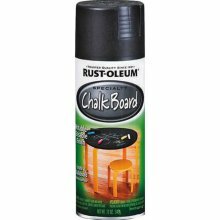 Please visit my Chalkboard Paint Tutorial for more info on the paint and primer I used. Thanks for visiting! Have a fantastic week. We have 2 more very busy weekends coming up, so I probably won't be posting a ton in the next 2 weeks. 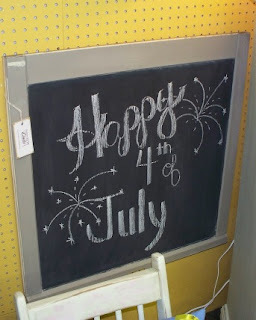 Have a wonderful 4th of July! So my daughter and I headed out today for a little Father's Day shopping. We went to the bank before heading to JCPenney's. I had a $15.00 coupon good for any $15.00 purchase (if you work it right....FREE money), plus the normal...$20.00 off if you spend a $100.00, $15.00 off is you spend $75.00 and $10.00 off $50.00. Well....I had to pass the Goodwill on the way, so we, well I, decided to stop (this was NOT on the list). 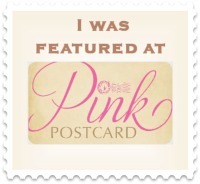 OH am I glad I did...my pocket book's not so glad, but I was happy. I headed for the furniture first, as I always do. Nothing of interest today! Browsed a couple of isles and then found what I thought would be the best find of the day. A basin bowl and pitcher! I quickly picked it up and flipped it over....Johnson Bros. Ironstone! I'm flipping the bowl in every direction possible looking for the crack, the massive chip, the huge stain....NOTHING! Nothing? Am I missing something? How could this be? So I looked one more time....Nothing! So into the cart it went. My heart was racing. How is this still here? As I am putting it in the cart, my daughter says, "That's breakable mommy". My response: "YES it is....NO TOUCH!". The pitcher they had paired with it is quite pretty, but not ironstone. It is Wyandotte by Ford China Co. They are not a matched set, but being sold as one. Oh well....who cares. Love it anyway and I had to have that bowl. So are you ready to see my find? I probably will sell the pitcher at the booth (I think...I haven't decided), but the bowl I will be keeping. It will make a fabulous fruit bowl, salad bowl, dessert bowl...or just a sit and look pretty bowl. If you look closely, there is a tiny chip in the rim of the bowl. This is the only major flaw I could find outside of normal wear. I can' tell you how excited I am. My everyday dishes are all white and this will work PERFECTLY with them and I needed a large bowl. So just when I thought it couldn't get any better than that! I round the corner and find a FABULOUS milk glass lamp that is COMPLETELY INTACT. Again, my stomach does a couple of flips and I am looking around to make sure no one is coming to steal my lamp. I have been looking for the perfect lamp for our bedroom and this one was coming home with me. 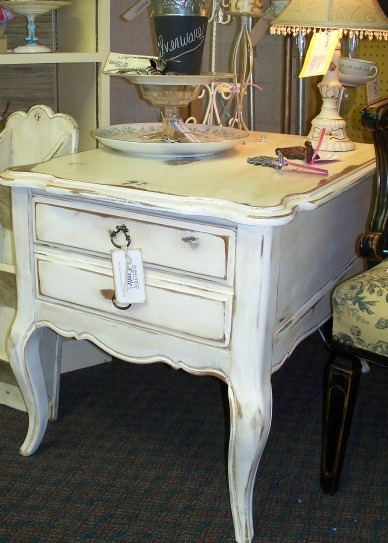 I love milk glass and to find this all in one piece ....AMAZING! There is a clear glass shade that is under the white hobnail globe that sticks out the top slightly. You can't see it from the light in the window. I still can't believe I found this all in one piece. To my mother-in-law....I have my own purple lamp now...Stay clear everyone! Now to explain, for those of you that are wondering what the heck I am talking about. My mother-in-law has a beautiful lamp that sits in her living room, similar in style, but with purple glass and a hand painted floral shade with.... you guessed it, purple flowers. Everyone of us has heard "Don't break the purple lamp". I once had a dream it got broken. It was really a nightmare...but the good part is, in the dream, I was on the couch so it wasn't me that did it. Phew! Unfortunately in the dream...I didn't see who did it. What I do know...it wasn't me and that is all that matters. So, Yes we did finally make it to JCP and we found some good things for Father's Day, but I can't post that now or Mr. T will know what we bought. So instead, I will share some new additions we added to the booth last weekend and a few new additions for this week. 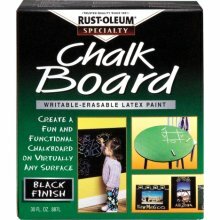 Fun, Summer, Chalkboard Entertaining Pieces. 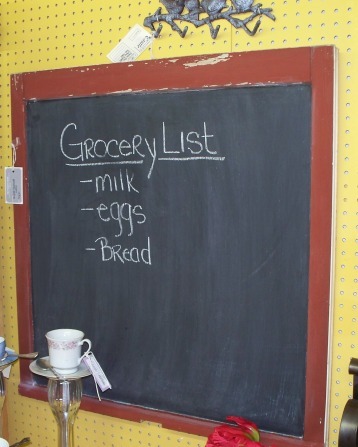 Made from galvanized tubs and painted with chalkboard paint. I will share how I did this in another post. Tiered server made from a vintage china plate, platter and compote. I really like this piece and want one of my own. I just need to find the right dishes that will blend with my current china. HAPPY FATHER'S DAY! to all you wonderful fathers out there! We love you and thanks for all you do. We don't say it enough. 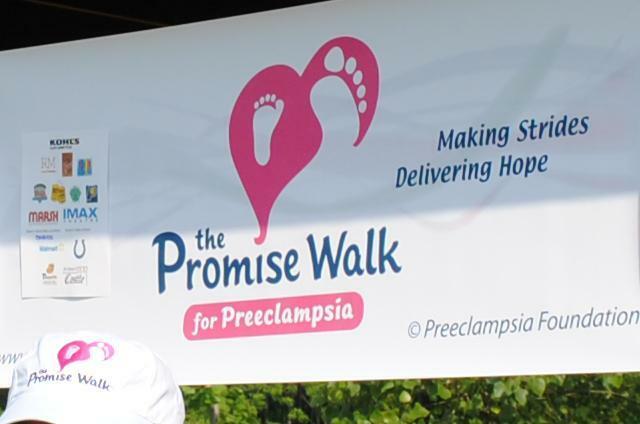 As many of you know, I have spent the last 8 months coordinating the first Promise Walk for Preeclampsia in 5 years for the Indianapolis area. 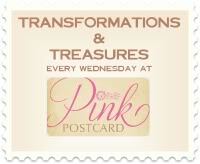 With the help of my fabulously supportive husband (Mr. T) and a new friend, Jessica, the 3 of us pulled it off. We had approximately 40 people walk and raise over $5500.00 to help in the education and research of Preeclampsia. This has truly been one of my biggest accomplishments in my life.... outside of birth! It feels good to know that I personally completed such a large undertaking, but most importantly we are helping raise awareness about this life threatening and devastating disease. Can you believe that every 6 minutes in the US, a mom and her baby face life threatening consequences from preeclampsia? And many don't even know what it is! Thank you again to everyone that came out, supported us and help raise funds. Thank you to our sponsors, Reachmore and Kohl's! Thank you to the following for their In-Kind donations to support the walk or our silent auction: Marsh Supermarkets, Panera Bread, Indiana Fever, Indiana Pacers, Indianapolis Colts, Healing Touch of Central Indiana, Steve's Bunk Beds and More, The Pauper's Castle, Indy Boot Camps, Indy Fit Kids, Gold Medal Personal Training, Indy Fit Seniors, Pin Heads Bowling, Incredible Pizza, DiCarlo's Italian Kitchen, Primrose Schools. A big thank you to the following family members. We could not have pulled this off without you. My sister-in-law, my mother-in-law, Jessica's mom and husband. An extra special THANK YOU to Jill our Chicago Walk Coordinator and Kathy one of our board members, for making the long trek to Indy just to help out. Another EXTRA SPECIAL THANK YOU to the Kohl's Ladies. You were a tremendous help! 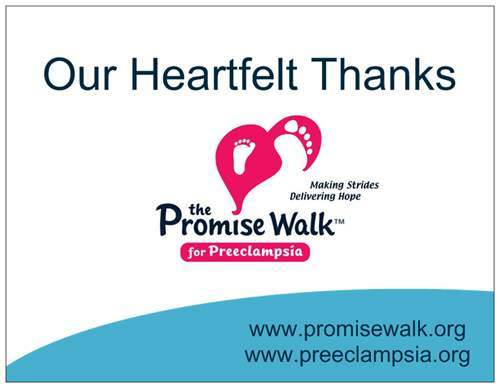 Thank you again to all of our walkers and donors! We look forward to another successful walk next year! Won't you please join us! Now, enjoy some pics from our event! Susan her her family. 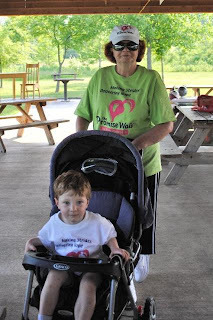 Susan coordinated the VERY first walk in Indy back in 2006. She was great moral support. Thanks Susan! My fabulously helpful sister-in-law and my niece. She was the sitter of the day! Thanks for all your help. Jessica's mom and son. Thanks for all her help! 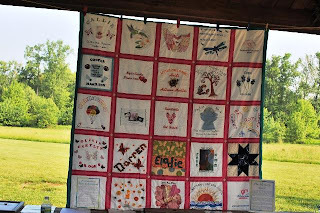 Memorial Quit. Remembering those that have not been as fortunate as we were. We were very honored to be able to display this at our walk.